Pastor Layth serves as the Vice President of the Haggai Institute. 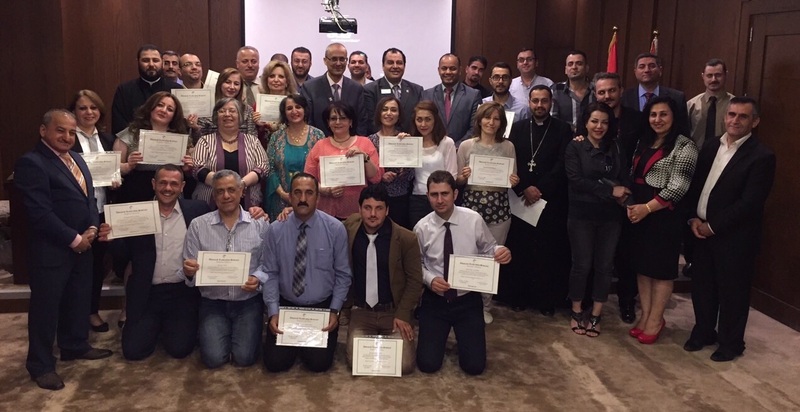 In his words, “We planted the institute this year to help all the leaders of Churches throughout all of Iraq.” The objective is to train and encourage pastors and workers in Evangelism, Discipleship and Church Planting. Several teachers flew in to join with pastor Layth from Egypt. The rest in attendance were all Iraqis. This is a concerted effort to join forces and work cooperatively together for the spread of the Gospel in Iraq and the Middle East. Meeting in a community tent in Sharia Refugee Camp, pastor Layth gathers with a group of Yezedi youths. Here, he shares the gospel for two hours with twelve unsaved young people. The red pillow is part of his teaching, it represents the blood of Jesus. Most have mobile phones. He tells them that the phone represents their individual lives; God has their number. He demonstrates that when they lay down their phones on the rug and cover it with the red pillow this is symbolic of believing in Jesus. Now, he says, God no longer sees you and your sins, He only sees His Son. They get it! Eight of the twelve answer his alter call! He will continue working with these young people and teach them how to reach others in the camp. He also meets tent to tent with whole families throughout this huge city of tents.